December 20, 2005 -- Last week Canadian Scouting's national publication, Leader Magazine, refused an ad from SCOUT eh! that it had initially accepted. What changed their minds? We believe Scouts Canada management did. On November 1st SCOUT eh! began discussing the idea of placing an advertisement in Leader Magazine to pique interest in SCOUT eh! 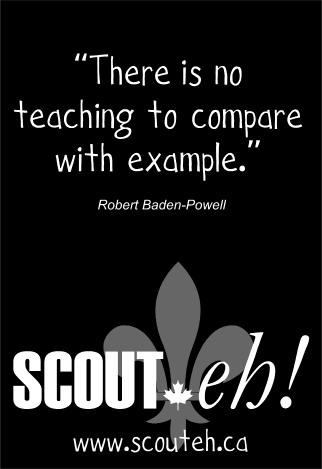 and to demonstrate that we are committed to Scouting in general and Scouts Canada in particular. Over the next few weeks the idea gained support amongst SCOUT eh! membership and many supported the ad financially. I have discussed your proposed advertisement with Ross Francis, Executive Editor of the Leader Magazine and while we recognize your group and respect its rights, we do not believe it would be appropriate to promote your group in our magazine. Therefore, we will not be able to place this ad in an upcoming issue of the Leader Magazine. Their magazine? All members of SCOUT eh! are members of Scouts Canada. As members of Scouts Canada, it is our magazine. In spite of repeated protestations that they are open to discussion and new ideas, Scouts Canada's management takes every opportunity to stifle any dissent or discussion. Our ad was chosen specifically to avoid inflammatory language, yet it seems that the very fact that the ad comes from SCOUT eh! is the problem. This is the action of an entrenched and unresponsive management team. SCOUT eh! has responded to Mr. Francis. We will continue working for democracy and reminding management who Leader Magazine and Scouts Canada belong to: all the members. And we will continue, as we always have, to advertise membership in Scouts Canada on our homepage. If you haven't joined us already, we would love to have you be a part of the struggle to save a once proud movement in Canada.